I’m glad that the RepRap already uses bio-degradable PLA as a main material and that we have a proof of concept prototype recycler. I donâ€™t see such a dark future. Plus, we can produce sparse objects more easily than with injection moulding and still have a decent exterior, requiring no assembly or expensive multi-part moulds. I think 3D printing is part of our much more innovative future. Itâ€™s not a separate peripheral product that we will have in our homes, itâ€™s a transformative enabling technology, much like the internet, that will catalyze physical product innovation. As a RepRap 3D printer owner I (can) speak from personal experience: This week, it printed out another RepRap (all its parts, I need a couple of weekends to put it together). Itâ€™s quite efficient compared to having lots of parts shipped from overseas and then realizing youâ€™ve spent 80 dollars on pulleys that do not fit. After doing exactly this, I designed the part and printed it myself. The printed part did fit and I could instantly see if it wasnâ€™t the wrong size before printing out the required batch size. Look in your drawers and closets, they are filled with things that are not entirely or exactly what you needed. What if you could change, upgrade the products that you used? If we had the source code to the product and could generate a version for testing its usefulness on the spot, that would change things! What about fabbers upgrading themselves? This saves you from having a new 3D printer every time. Just like we prefer to buy a new inkjet printer once the cartridge runs empty, because itâ€™s hardly any more expensive than just the cartridge. What about people (re)using (junk) electronics combined with printed parts to make new things? We collect so much stuff “In case we need it”. Would we still be doing this when we could have it as soon as we really encounter a need? These are printable designs. The manufacturing data can be downloaded and executed by a 3D printer or other flexible production technology. This means having reduced +/- 16 euros, mostly coming from inventory, packaging, handling and shipping costs to less than 16 cents. That’s a > 100-fold decrease in costs! Added benefit is that you don’t need to wait days for it to arrive. Well, less than 10 minutes probably. That’s the second 100-plus-fold decrease, time! These are products for which the current distribution model cannot compete with a digital distribution and print-at-home scenario. 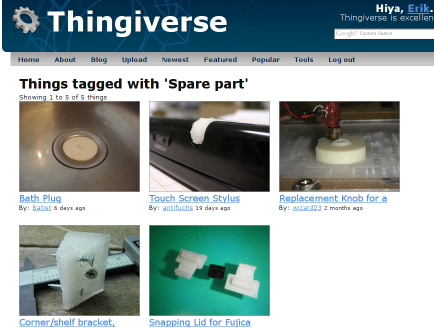 Once RepRaps and makerbots are more common, this will generate an immense value! It allows us to fix things and counter product obsolescence. Also, I regularly print out things that I would otherwise need to go to the store for. This saves gas and CO2. With mass production you end up either under or over producing. To prevent underproduction, you end up making the trade off between production and opportunity costs of not producing. All this overproduction is waste and is inherent in make to stock manufacturing of physical goods. 3D printers are make to order production technology. The result is that products for which there is an actual market will see the light of day, other simply wonâ€™t, theyâ€™ll stay digital. While this is important for innovation, it clearly doesnâ€™t have the waste problem. What about open, modular parts where you have â€™situated physical productsâ€™ that help you with a certain task for a week, and then can be reconfigured to help you with another task. I believe open source aids in this standards formation. Right now all our products have their own engines, batteries/power supplies and processors while we use only a few at the same time. This â€™situated hardware solutionâ€™ requires a combination of generic and solution specific parts that are designed to be reconfigured. Thatâ€™s where fabbers (such as 3D printers) come into play. Right now products are so integrated that if one thing breaks, we end up replacing it all. One more thing: If the question is â€œShould we ban 3D printing on environmental grounds?â€ you implicitly assume that you could ban it. While theoretically it would be hard, how would you enforce it? It is hardly possible nor is it beneficial to try. For a more detailed comparison of the environmental costs of local fabrication (ship homogenous raw materials once) to centralized fabrication, see my post on the open manufacturing list. 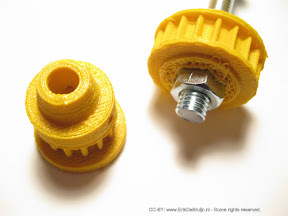 Next story Accessories evolution: Spindle holders! Using recyclable materials is clearly the solution. However, 3d printers will have a revolutionary impact on the way things are done that will offset the environmental cost. The ultimate evolution of the 3d printer represents a massive reduction in the delivery and transport system. Electronic blueprints will allow almost any device to be created on site without requiring the massive infrastructure that goes into supporting our consumption based culture. The number of work at home jobs this technology can create are significant. This goes way beyond simply creating replacement parts, and gets to the heart of physical application of information. What’s going to be more “interesting” will be the enforcement of patent violations for certain kinds of objects, packaging, and so forth. Will the government be paid to create DMCA-like legislation to counter fabbers? If digital copiers are treated like thieves, how will atomic copiers be treated? Absolutely. Even better is you can produce your own windmills with a bit of ingenuity. These machines will only get better. Be interesting to see what happens when copyleft patents and blueprints run up against the machinery that wants to keep the status quo. Always a possibility that there will be an attempt to enforce licensing on what the raw materials can be used for as well. There are powerful industries which a future reprap will make obsolete. I am surprised there have not been more attacks of this kind already. I expect to see more. However to answer the point raised in good faith. Non-biodegradable plastics can be reused in a reprap. That includes mass produced items as well as those produced by repraps themselves. Hense this technology could be used to clear up the earth and therefore should be encouraged. On a personal note I am already saving milk bottles (hdpe) to be converted into feed stock. This means I will be recycling without the added energy requirement of moving waiste to the local dump and sorting issues before it is recycled in a factory (probably on the other side of the world). The question is should I be getting carbon credits for using a reprap in my direct recycling efforts? Copy of a reply by Phil Reeves in another thread: “In terms of the impact modelling, we are fully aware that the production method is only a small element of the overall lifecycle environmental impact. In fact, detailed experimental trails we have undertaken with a number of additive processes show that in many cases if is negligible when compared to the embedded CO2 within the raw material, and certainly the usage phase. Albeit, it is invariably higher than more traditional alternative production process per KG of material processed. It is also worth noting having looked on your blog site that even materials such as PLA, although biodegradable, also have an embedded carbon footprint, as they require energy to grow the crop, process the raw materials and polymerise. PLA has an embedded carbon footprint of 2.4 Kg CO2 / kg compared to ABS with 3.5 kg CO2/kg, so there is no order of magnitude benefit there! 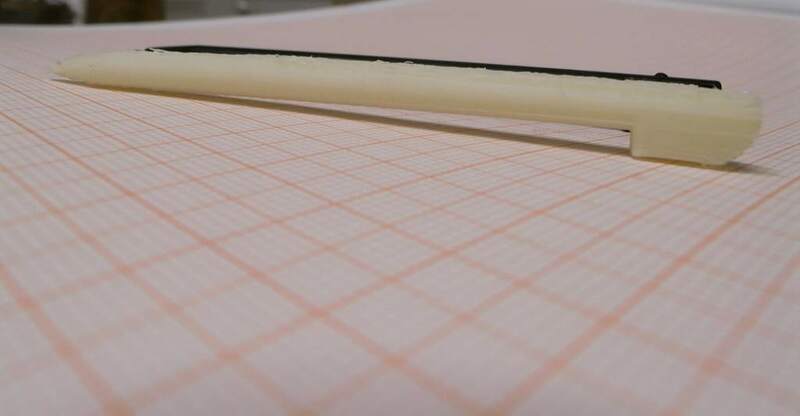 However Nylon is 5.5 kg CO2 / kg, which does suggest that the amorphous thermoplastics used in extrusion based processes are more sustainable than the crystalline polymers used in SLS. You are also right that different AM processes also have significantly different footprints. The problem with additive processes is that modelling the production process is significantly more complex than processes such as injection moulding. With moulding you have a single tool, with a fixed volume cavity, running at a pre-determined cycle time. It is therefore relatively simply to model the tool making, moulding and materials supply chains. With AM processes you have an infinite number of different geometry parts that can be manufactured concurrently within one build envelope, all impacting on build time and therefore fore energy consumption. Moreover, with processes such as SLS, you then have to consider packing rations and material waste streams (refresh rates). 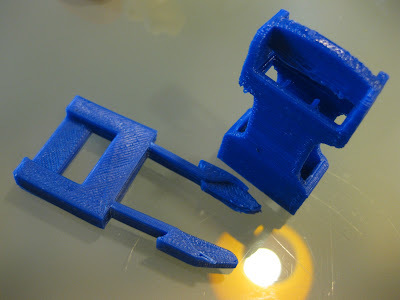 With processes like FDM, SLA (and the dual head RepRap), you also have to consider orientation and support structures. It is complex, but it can all be modelled. To be honest â€“ with AM, forget process efficiencies, distributed supply chain models, eliminating stock holding and warehousing. Go straight for the things that really count (1) minimising raw material consumption â€“ design products that use less material, which can only be realised using additive processes (2) focus on designing light weight products that contribute to lower life-cycle CO2 such as aerospace and automotive parts, or fluid / gas flow parts where efficiency can be improved (3) use processes chains that mitigate waste streams (4) look to reduce â€“ reuse â€“ recycle â€“ reclaim (energy) â€“ dispose in that order. Obviously for carbon footprint PLA is still not perfect. But there are other things such as biological life having trouble with non-degradable polymers. That is only true if you assume that we will throw everything away that we will print ourselves in the same way as we throw everything away industry now sells us. But once you have the ability to make things, waste takes on a different dimension. Why would I throw something away that I can turn into raw material again for my fabber? Our behaviour will change because of it. Even if we won’t be using biodegradables. It also seems to assume we will create stuff on top of what we already buy from industry. Every throw-away plastic trinket made in China that is replaced by a self printed item, is already an environmental gain even if we through it away in the end. People have mentioned both the increased repair rate as well as the reduction in transport costs. This is confounded by the fact that you still have to transport the feedstock. However, there is also the tremendous reduction in waste from not making thousands of replacement parts, warehousing them, and then ultimately scrapping the unused. Yes, you will have to transport feedstock to some degree. However you will not need thousands of stores to display the end products of those feedstocks, which vastly streamlines although does not eliminate that portion of hte cycle. I also think people are more likely to keep or recycle items they have personally produced. The comment about the infinite geometries requiring greater power consumption is disingenious. Mass produced injenction molded items each are in continuous production for the entire production run. The degree of specialization often requires continuous operation of entire factories with all the secondary implications of that structure, built around the industry. How many junk novelty items that are produced from large scale production runs of this type would actually exist let alone occupy the resources of a full on factory and its secondary resource chains and later the landfills (plus moving stuff there and future cleanup).. if people could simply create items that they really had a more than transitory interest in. Items that no one had a real intent to use, would simply not be produced. The effect overall would be enormous. I have young kids! Even if you could get 1% of the crappy “Happy Meal” type toys that have a life of about 5 minutes out of the waste stream it would be a huge benefit! Imagine if you instead got a coupon do download a part or design or part of a toy that you could modify. a) They would be cast and thus solid. b) They would be made in China and transported all around the globe burning even more oil. 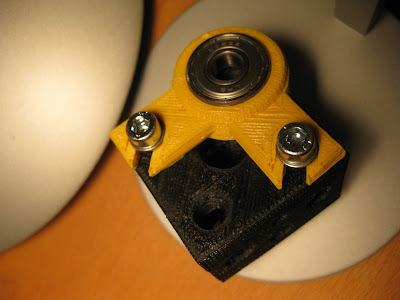 “[A] 3d printer generates a useful item on the spot without the following additional resources.